The Dermot Weld-trained Fascinating Rock booked his ticket to the Investec Derby at Epsom after enjoying victory in the Grade 3 Derrinstown Stud Derby Trial at Leopardstown. Having finished unplaced on his only start as a juvenile, Fascinating Rock made a winning return over the Derrinstown course and distance at the end of March before adding the Ballysax Stakes to his CV in fine style at Navan. Sent off the even-money favourite to make it three from three for the year in this prestigious Group Three contest, the three-year-old was settled at the rear of the six-strong field in the early stages and was still last rounding the home turn. First-past-the-post Ebanoran (8-1) made a decisive move at the top of the straight, with Declan McDonogh's mount quickly going through the gears to carry him into a clear lead. Fascinating Rock was briefly caught flat-footed, but got rolling late in the day and there was just a head in it at the line. A stewards' inquiry was quickly called and the replays showed Ebanoran had first caused interference to the eventual third, Geoffrey Chaucer, and then leaned into Fascinating Rock in the dying strides. After lengthy deliberations, the first two places were reversed and Weld emerged from the weighing room to shake hands with Oxx and offer his commiserations. McDonogh was handed a three-day careless riding ban. Weld said: "I don't want to win any race that way (in the stewards' room). I thought he was the best horse on the day and interference happened, but it was a very messy race. Pat was adamant that the interference cost him the race. "He's a big, long striding horse and as they quickened off the home turn, he just lost his hind-end momentum. "I've been teaching him to settle and switch off at home and it's the first time he's really been asked to sprint. It just took him a few strides to react. "I'd be pretty definite that he'll go to Epsom and he'll certainly have learned a lot today." 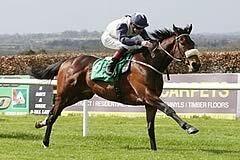 It is not out of the question the first two could meet again at Epsom on June 7 as Ebanoran also holds a Derby entry. Oxx said: "It was unfortunate, but there was only a head in it. I was impressed with the turn of foot he showed and he's an improving horse. "He doesn't have any great ground preference. We'll have to discuss it, but there's every chance he will go to Epsom. "He's a good horse and he's going the right way. "He's by a sprinter (Oasis Dream) out of a stayer (Ebadiyla), but putting speed into his pedigree was what the family needed."